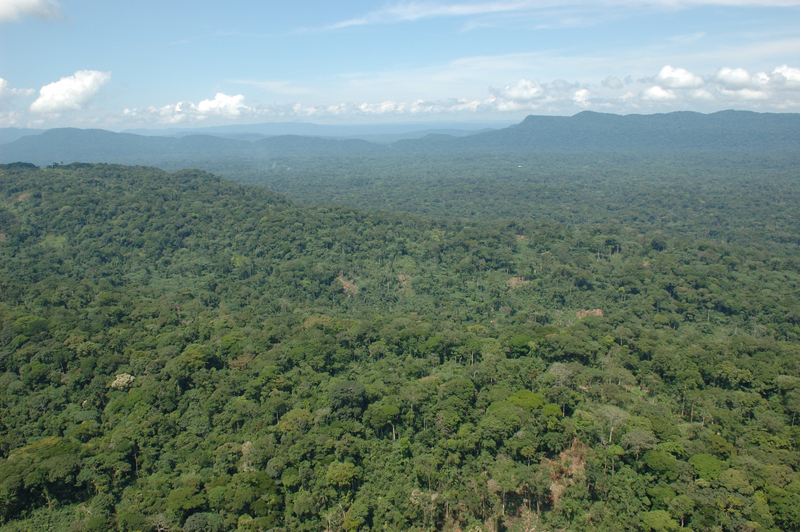 Forests are both important carbon sinks and vital economic resources for developing countries like the Democratic Republic of the Congo (DRC), and Brazil. COP21 offers these countries a chance to impress this upon the international community, and to make the developed world understand the cost of conserving the “lungs of the planet”. The second day of the international climate negotiations (1 December) was dominated by the issues of fighting deforestation and forest restoration. And with good reason. After the oceans, the forests are the world’s second biggest carbon reserve, and they are being cut down at an alarming rate. Not only does this reduce the planet’s ability to store carbon, but deforestation and land use change are also extremely carbon intensive activities. Every year, deforestation and forest degradation releases between five and ten gigatons of CO2, making forestry the second most carbon intensive sector of the economy, after the fossil fuels sector. Despite being curbed to some extent, deforestation continues to wreak havoc with important ecosystems. Some 129 million hectares of forest have been lost since 1990, according to the 2015 Global Forest Resources Assessment carried out by the FAO. This represents an area roughly the size of South Africa. And the trend is still going strong, particularly in Africa and Latin America, which have lost 2.8 and 2 million hectares of forest respectively since 2010. But in a rare piece of good news, the report stated that net global deforestation has slowed by more than 50% in the last 25 years. During COP21, certain developed countries have already announced finances aimed specifically at the challenge of deforestation. Germany, Norway and the United Kingdom have pledged to mobilise $5 billion for forestry projects between 2015 and 2020. This will be allocated to forested countries that are willing to make real CO2 emissions cuts by fighting deforestation, through the REDD+ financial mechanism for Reducing Emissions from Deforestation and forest Degradation in developing countries. Launched in 2008, this mechanism provides financial compensation for countries that make efforts to reduce deforestation from planned levels. Anti-deforestation measures taken by different countries as part of the REDD+ scheme will not be an integral part of the Paris agreement, but will be included in the agenda of solutions, a system that is not universally popular. “We expect REDD+ to be integrated into the Paris agreement so that certain countries, for whom forestry is the only carbon intense sector, can obtain financing,” said the DRC’s Minister of Environment, Nature Conservation and Sustainable Development, Robert Bopolo Bogeza. Within the agreement currently under negotiation in Paris, the question of the forests is far from settled. “All references to forests […] in the draft agreement appear in brackets, which means they do not benefit from the support of all the Parties and they are still subject to debate,” the WWF stated. The Ivory Coast has a similar dilemma. Deforestation has boosted the economic development of the country, enabling it to become the biggest cocoa exporter on the African continent. “We have gone from 12 million to 2 million hectares of forest in just a few years,” said Rémi Allah-Kouadio, the Ivory Coast’s minister of environment. “The deforestation that we have carried out has been for a good cause, but now we have to change this forest-agriculture relationship,” he added. The expansion of agricultural land is responsible for a large proportion of deforestation. This is particularly true of the poorest countries, where the majority of people make a living from farming and do not hesitate to cut down trees to free up more land. “We have to be able to produce more with less; to move from an extensive agricultural model to an intensive one,” the minister said. To make this possible, the Ivory Coast has decided to experiment with mixed land use. Thanks to a World Bank programme, Allah-Kouadio’s agriculture ministry has launched a pilot project for farmers to grow cocoa in the forest. The Democratic Republic of the Congo, which has one of the world’s largest forest basins, has taken a series of measures to protect its forest assets. A spokesperson from the ministry of the environment said, “We are working closely with the ministry of agriculture to establish a map of degraded land.” The aim is to identify priority areas for restoration. “We foresee the end of deforestation between 2020 and 2030,” the DRC’s minister of environment said. “But someone has to pay for the DRC’s efforts to re-establish its forests,” he stressed. The United Nations Framework Convention on Climate Change (UNFCCC) was adopted during the Rio de Janeiro Earth Summit in 1992. This Framework Convention is a universal convention of principle, acknowledging the existence of anthropogenic (human-induced) climate change and giving industrialized countries the major part of responsibility for combating it. The adoption of the Kyoto Protocol at the Earth Summit in Rio de Janeiro, Brazil, in 1992 was a milestone in the international negotiations on tackling climate change. For the first time, binding greenhouse gas emissions reduction targets were set for industrialised countries. The protocol, which entered into force in 2005, was intended to cover the period 2008-2012. A longer-term vision was introduced by the Bali Action Plan in 2007, which set timelines for the negotiations towards reaching a successor agreement to the Kyoto Protocol, due to expire in 2012. It was expected that an agreement would be reached by December 2009. Although Copenhagen, Denmark, did not result in the adoption of a new agreement, COP15/CMP5 recognised the common objective of keeping the increase in global temperature below 2°C. Furthermore, industrialised countries undertook to raise $100 billion per year by 2020 to assist developing countries in climate change adaptation and mitigation. Cancún, Mexico, in 2010 made the 2°C target more tangible by establishing dedicated institutions on key points, such as the Green Climate Fund. The willingness to act together was reflected in the establishment, in 2011, of the Durban Platform for Enhanced Action (ADP), whose mandate is to bring all countries, both developed and developing, to the table to develop “a protocol, another legal instrument or an agreed outcome with legal force” applicable to all the States Parties to the UNFCCC. This agreement should be adopted in 2015 and implemented from 2020. In the interval, until a legally binding multilateral agreement is implemented in 2020, the Doha Conference (Qatar) in 2012 established a second commitment period of the Kyoto Protocol (2013-2020), which was ratified by a number of industrialised countries, and terminated the Bali track. The Climate Change Conferences in Warsaw, Poland, in 2013 and Lima , Peru, in 2014 enabled essential progress towards COP21 in Paris in 2015. All the states were invited to submit their Intended Nationally Determined Contributions (INDCs) towards reducing greenhouse gas emissions ahead of COP21.